One Laptop Per Child is an education project, initiated by Nicholas Negroponte of the MIT Media Lab. OLPC created the extremely low power, rugged XO, inexpensive computers for children around the world and began development of a suite of Free Software for education called Sugar, since taken over by Sugar Labs. Here is a screen shot of the home view in Sugar, with a circle of selected Activity icons. You will see that there is no text visible, except in the tooltip shown here for Pippy, the Python programming editor for children. The central XO icon shows this user's colors, which also mark icons of Activities last started by this user (in this case, Terminal, Chat, and Turtle Art). The one icon (for IRC) shown in other colors was started by another user on a different computer, and shared with the community, incuding this user, who joined it in progress. Further explanations of icons, icon coloring, and other UI elements can be found in the FLOSS Manuals Sugar manual at http://en.flossmanuals.net/sugar. In addition to the languages currently available, OLPC and Sugar Labs are working on localizing Sugar software to about 65 more languages, listed at http://dev.laptop.org/translate. Materials for governments considering putting laptops and Sugar into their schools. The OLPC XO has its own hardware layout, so each of the Linux keyboard files has to be adapted to it. These modified files have been submitted to the upstream Linux distributions, including Red Hat and Debian and have made their way to general availability. The XO does not have a Caps Lock key (at the request of a child) and has an extra key for × and ÷, which are not in ASCII, but are strongly needed for elementary school arithmetic. The Wiki page section http://wiki.laptop.org/go/Keyboard_layouts#OLPC_keyboard_layouts links to pages for the language-specific layouts. 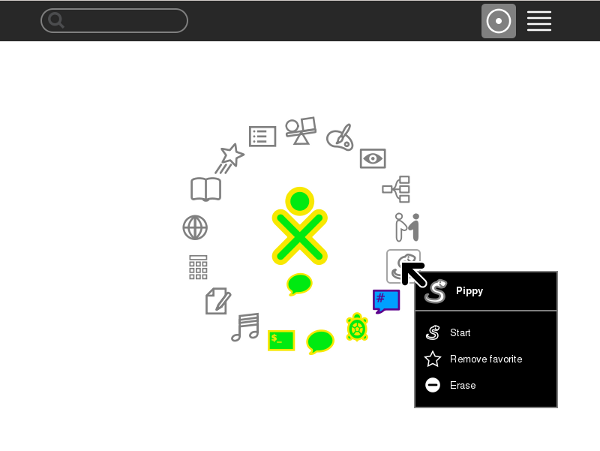 Changing the User Interface language is done through the Sugar Control Panel, accessed from the Home view by right-clicking on the XO icon, and selecting it from a menu. In the Language Control Panel there is a menu offering all of the languages installed in the Linux Operating System, whether or not Sugar supports them in Activities. The result can be an odd mixture of English and the chosen language, or of Last-Resort characters indicating that there is no font installed for the language selected. Sugar language support depends on a set of fonts covering the writing systems used in languages of target countries, other widely used writing systems, and some symbol fonts. For current deployments, this includes some subset of the following. The limited storage space on XOs makes it impractical to install fonts for all supported Unicode ranges. In addition, there are Unicode ranges for which no Free Fonts are available. It is important to distinguish between the locale set for the system overall, particularly in the User Interface, and the current keyboard and fonts that a user needs in order to deal with other languages. In general, Sugar uses standard Linux methods for selecting keyboard layouts and fonts, but plans to change from the existing xkb keyboard software system to SCIM (Smart Common Input Method), which is far more flexible. The xkb method only supports entering one character per keystroke, but there are many languages whose essential alphabetic letters are only available in multiple-character sequences in Unicode. This includes multiply-accented letters that local users may be used to typing as single letters on typewriters adapted to their languages. Unlike the situation in the United States and parts of Latin America, children in Africa and Asia commonly need to know their own local language, a standard national language, and an international language in order to function in society, and may want to learn other languages for business, research, or other purposes. In many former colonies, as in Ghana, parts of India, and other places, a foreign language such as English or French is the language of instruction in all of the schools. Former Soviet Republics have had a difficult time getting away from the use of Russian exclusively in schools, since most available textbooks are in Russian or other foreign languages, and not in local languages such as Mongolian, Uzbek, and so on. Making Free textbooks available in local languages is necessarily a large part of the program, although nobody has taken it on so far. Localization and translation work for OLPC and Sugar labs is done primarily by volunteers. Some machine translation is used to create drafts of Wiki pages, and some countries employ commercial services for their own purposes. Some in the Sugar community propose that localization and translation be assigned to the more advanced language students in the countries concerned as homework. This can include all of the categories of work described above, plus translating and writing Wikipedia pages in their own languages or any others they are learning. The same idea applies to any other software or content the community considers worthwhile. Teachers and students can examine a set of proposed translations, and construct a collaborative translation from the best work submitted. At some point, this kind of work can be extended to business plans for graduates to take to microfinance institutions.